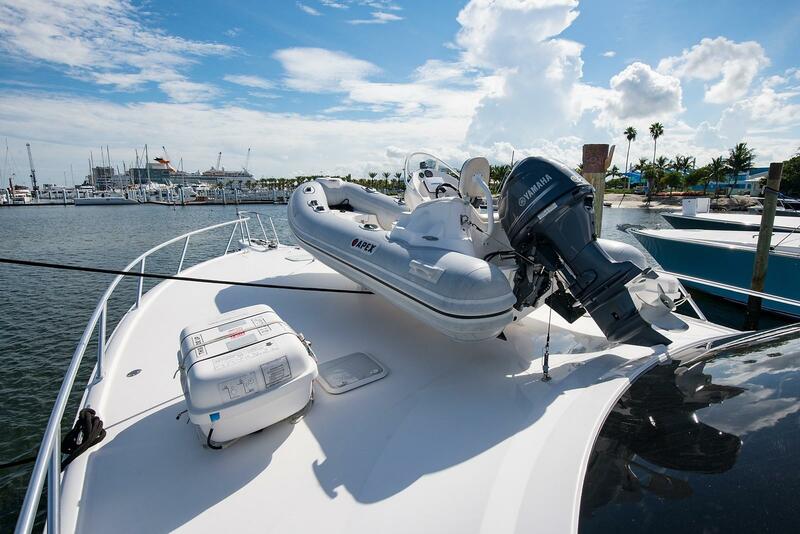 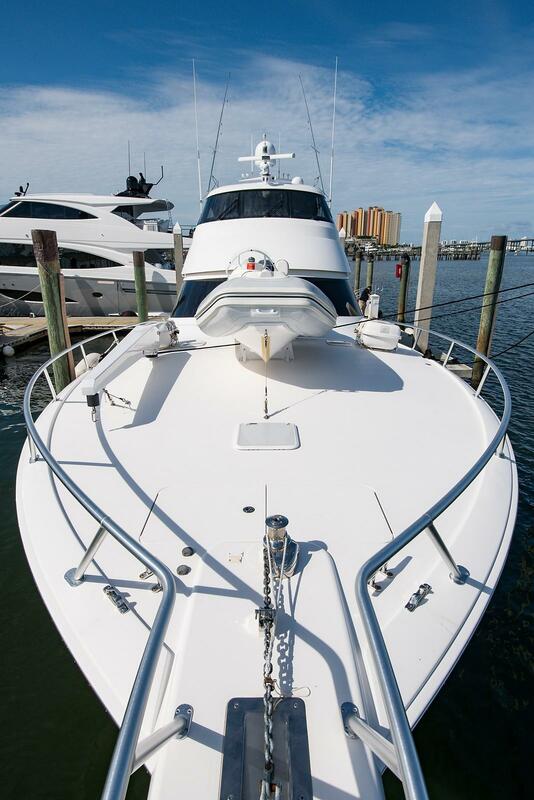 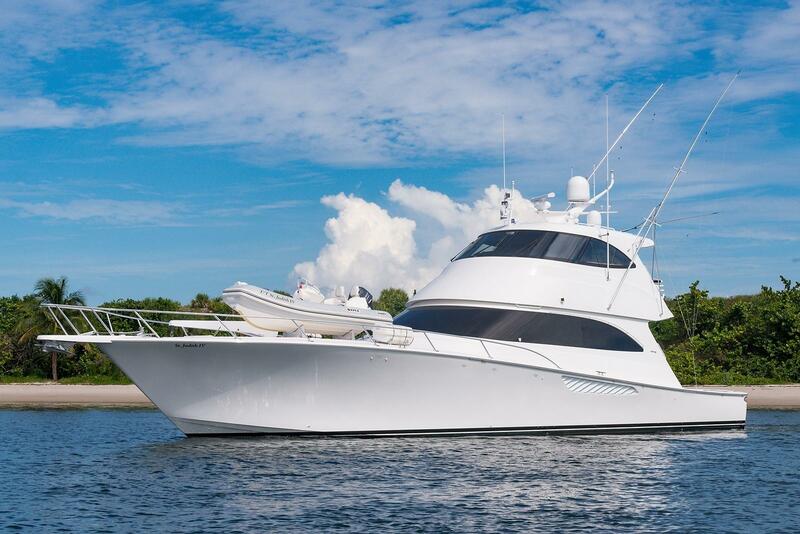 2013 Viking 66' Enclosed Bridge "St. Judith IV"
With impeccable engineering, elegant styling, and heart-stirring performance, the 2013 VIKING YACHTS 66’ ENCLOSED BRIDGE SPORTFISH ST. JUDITH IV is the yacht you have always wanted. 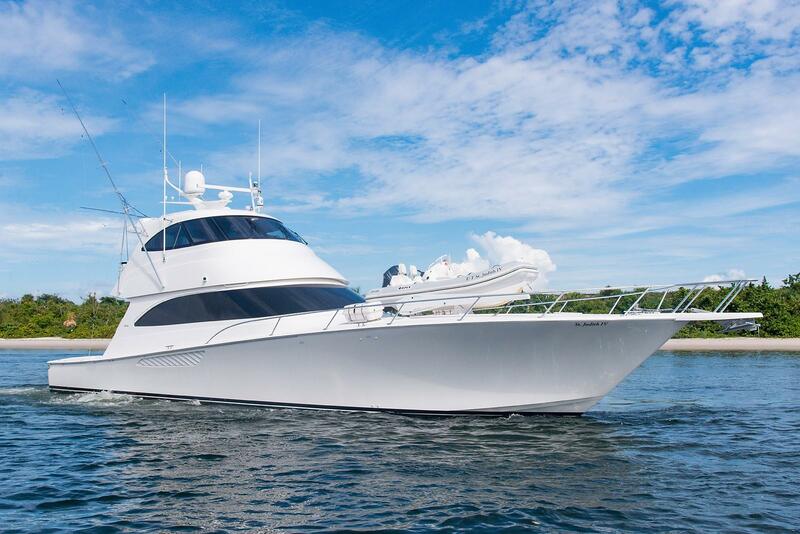 A blue-water masterpiece, the VIKING 66’ is in a class by itself with the seamless ability to redefine its mission whenever you take the helm. 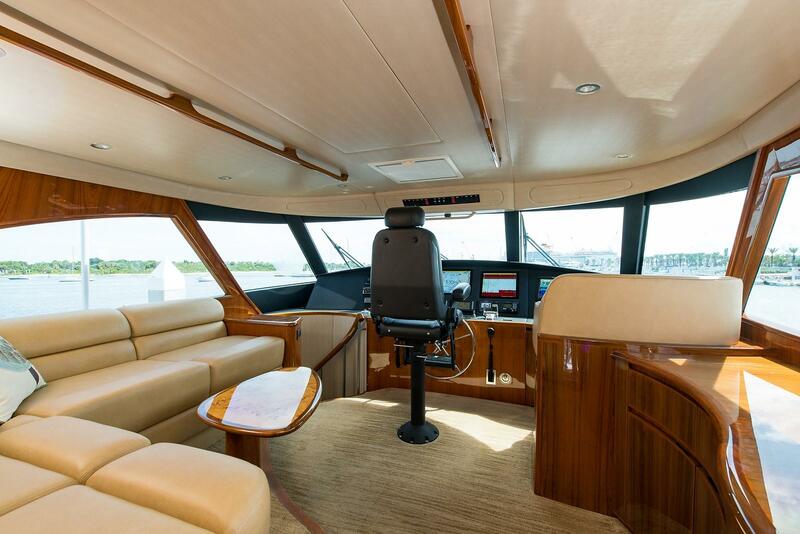 In its element 100 miles at sea or backing into the spotlight at the Winner’s Circle, or afternoon cruising with friends, the 66’ ENCLOSED BRIDGE showcases a history over five decades rich of building a better boat every day. 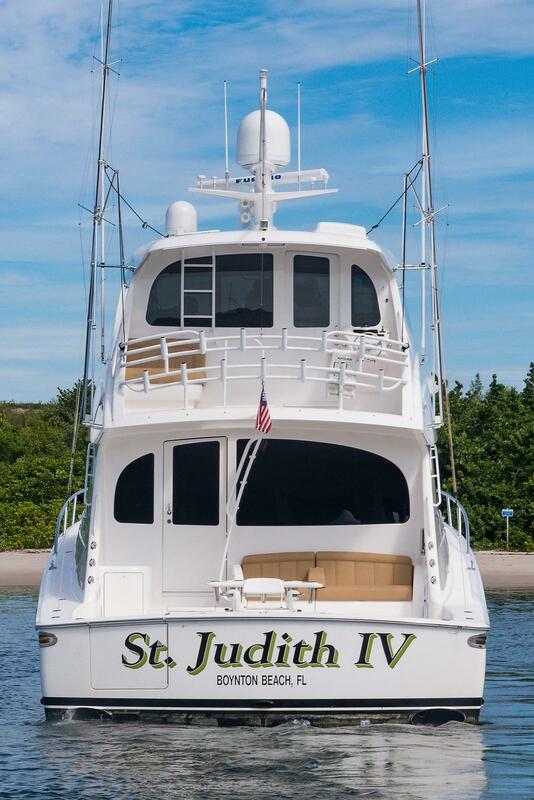 ST. JUDITH IV is all of this and more with the numerous upgrades unlike any other. 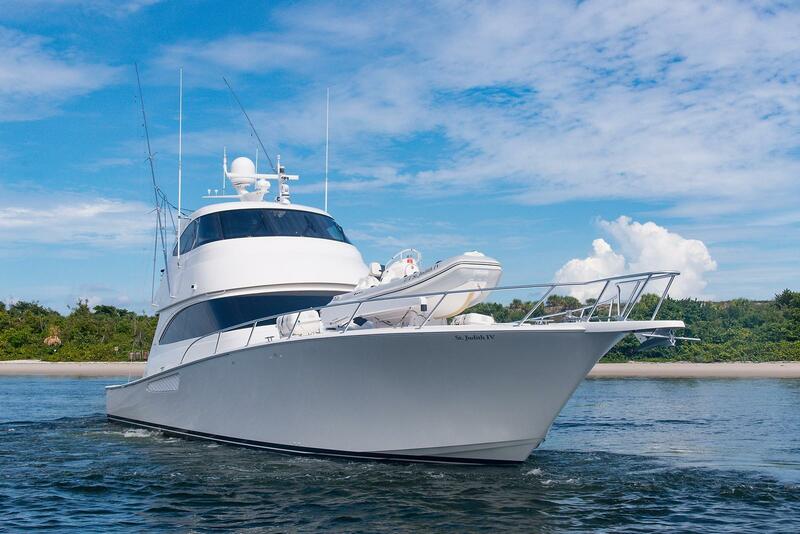 Don’t delay in seeing the 2013 VIKING YACHTS 66’ ENCLOSED BRIDGE SPORTFISH ST. JUDITH IV in person. 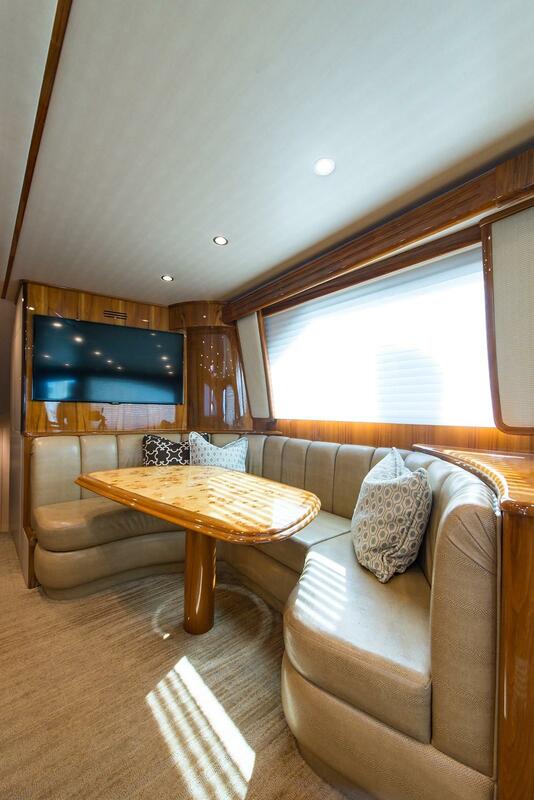 L-Shaped sofa to starboard, hi-lo table, custom shades, OctoPlex Multiplexing Distribution System, Icom VHF, bottle liquor storage, carpet runner, electric salon door, teak strips in ceiling, upgraded Bose home theater. 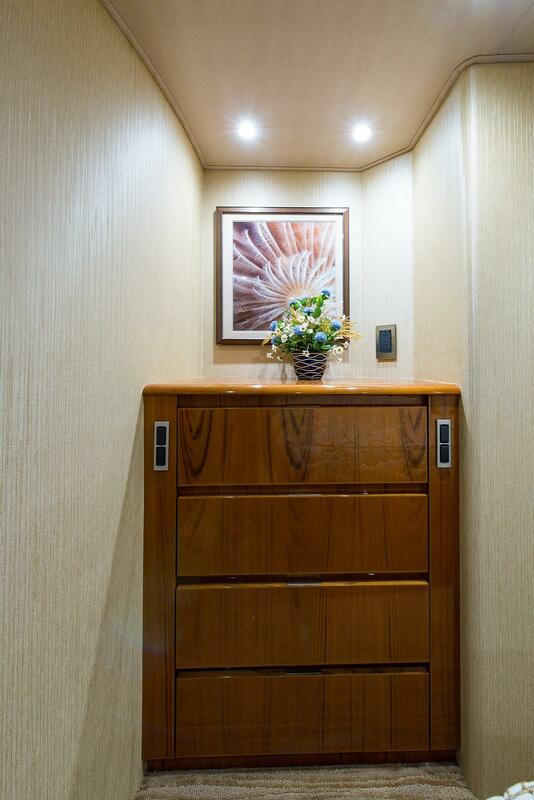 Day head located at entrance to Salon. 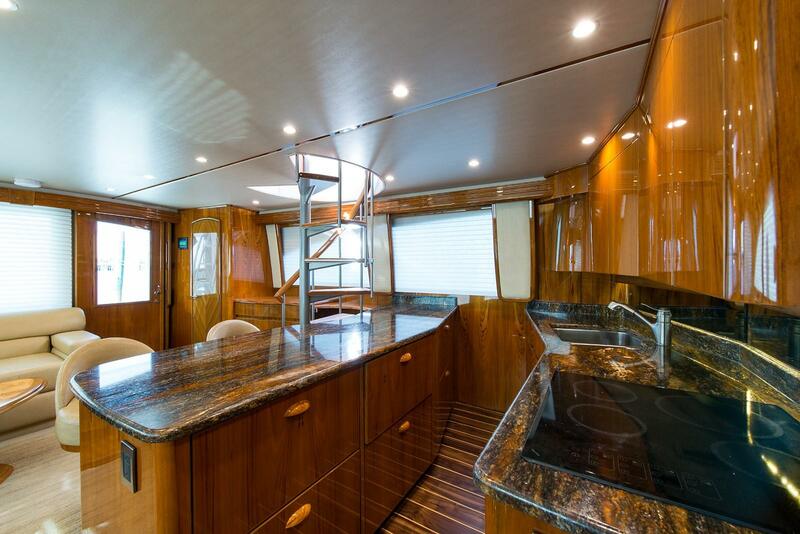 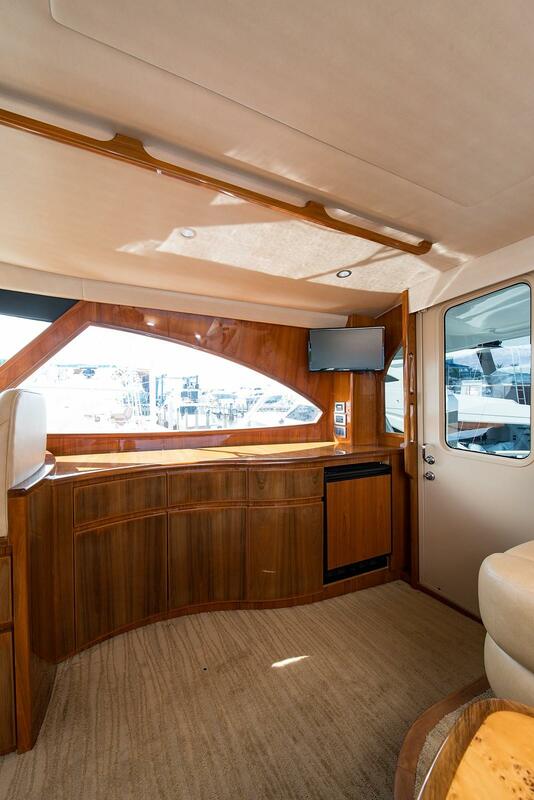 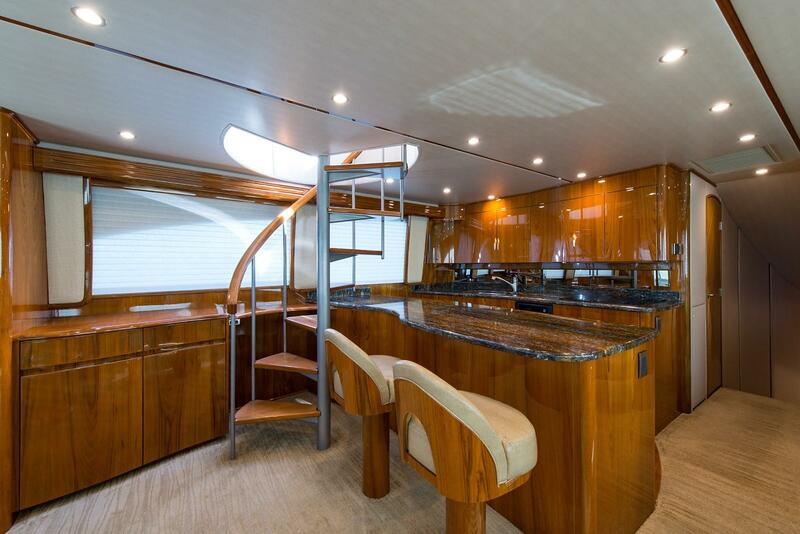 Forward is the comfortable dinette with seating for up to 6 with the Galley located to port just forward of the spiral stair case to the enclosed bridge. 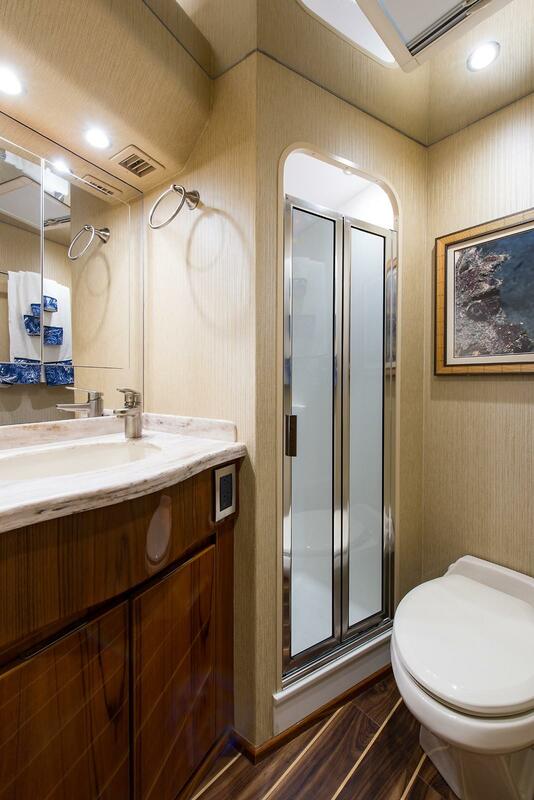 Located amidships to port is the sumptuous owners suite, highlighted by an athwartship king berth (with hinged storage beneath), Bose entertainment center, Samsung flat screen TV, 2 large hanging lockers, 5-drawer credenza, CruiseAir digital A/C, custom carpet flooring, and 2 night stands with lamps. 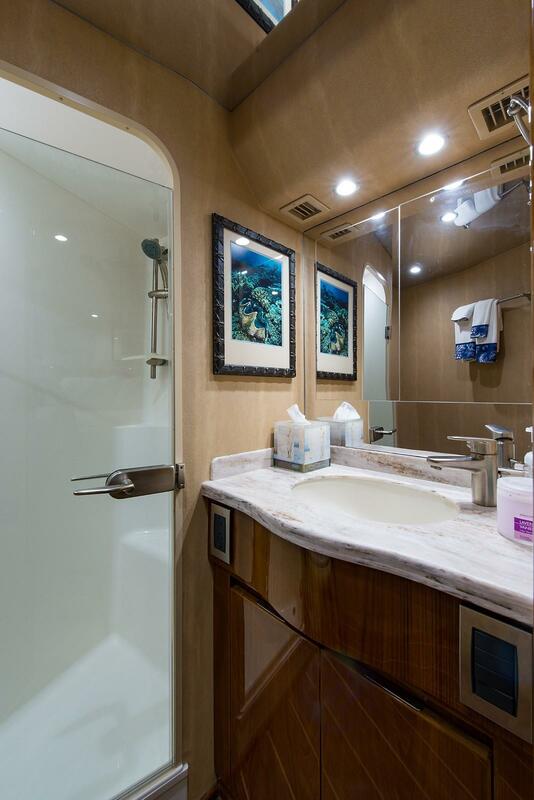 This beautiful stateroom also offers access immediately aft to the private head which features custom marble countertop, wood flooring, storage, and an enclosed oversized shower. 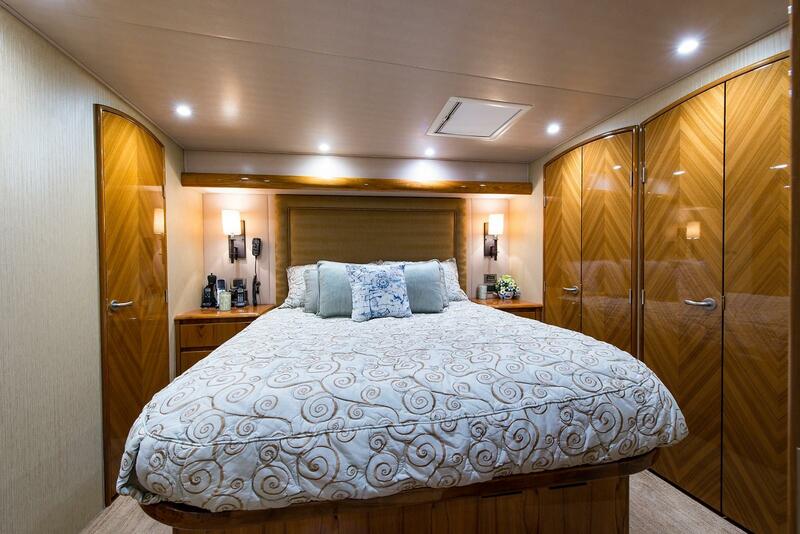 A centerline queen berth (with hinged access to storage below), with custom bed cover and pillows flanked by generous storage cabinets invites your guests to relax a while. 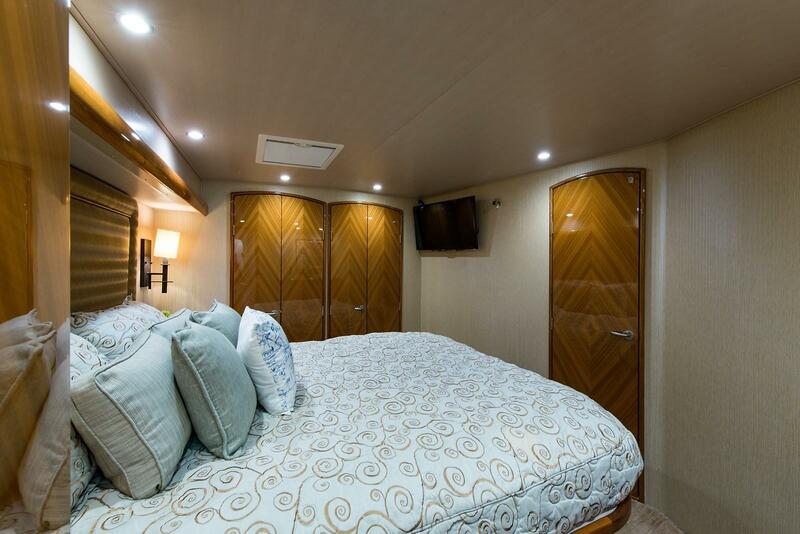 Comforts include a Samsung flat screen TV, hanging lockers and storage cabinets, and an overhead hatch for natural light and ventilation if desired. 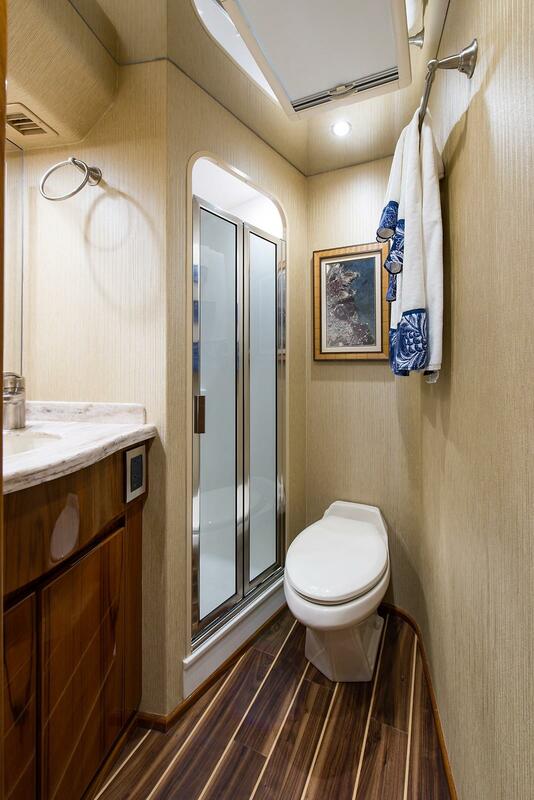 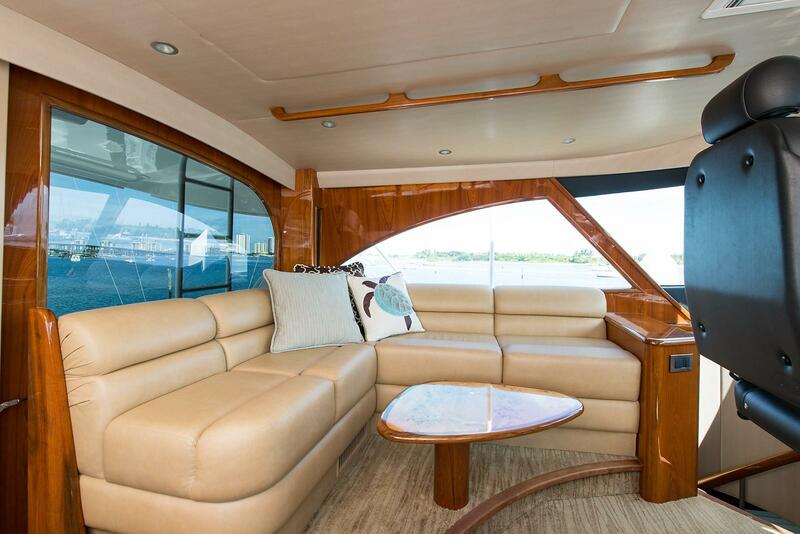 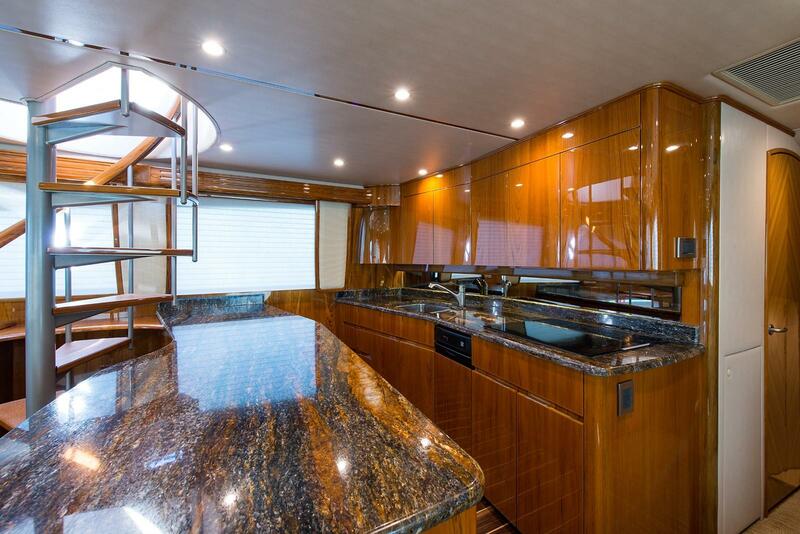 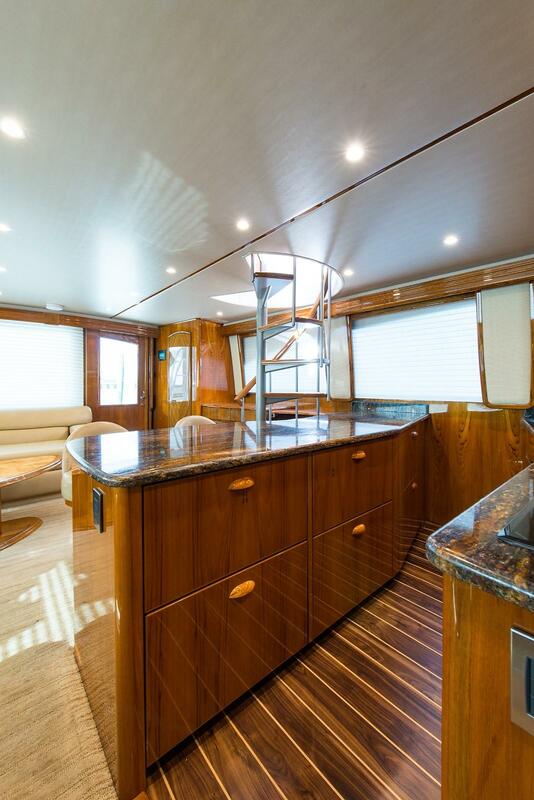 Adjacent aft to port is the very spacious head with wood flooring and a large enclosed shower. 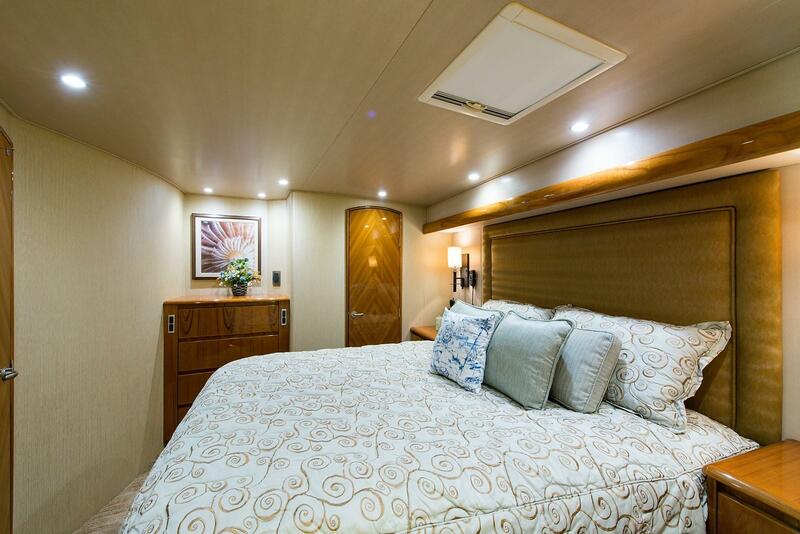 Starboard is another guest stateroom offering upper and lower berths with innerspring mattresses, storage beneath lower bunk, hanging locker, CruiseAir A/C digital control, overhead lights, speakers, and TV. 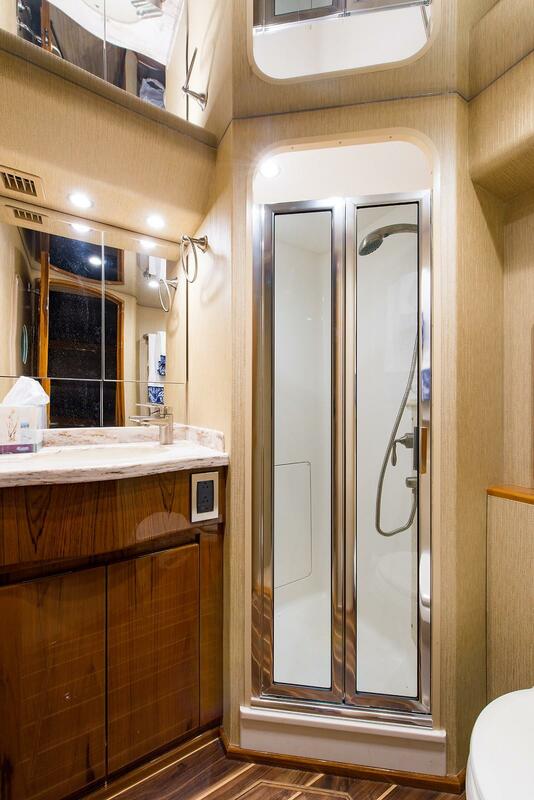 Access is provided aft to a private head with wood flooring, storage, an overhead hatch for natural sunlight and ventilation, and stall shower. 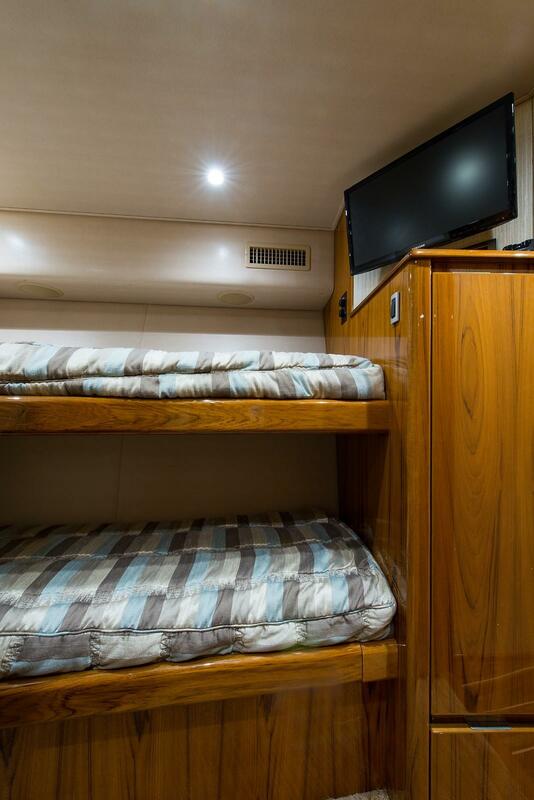 Aft to starboard is a stateroom featuring custom extended size upper and lower berths, Samsung flat screen TV, speakers, overhead lights, large hanging lockers, 5-drawer credenza & cabinet with shelves, and access to engine room via crew door. 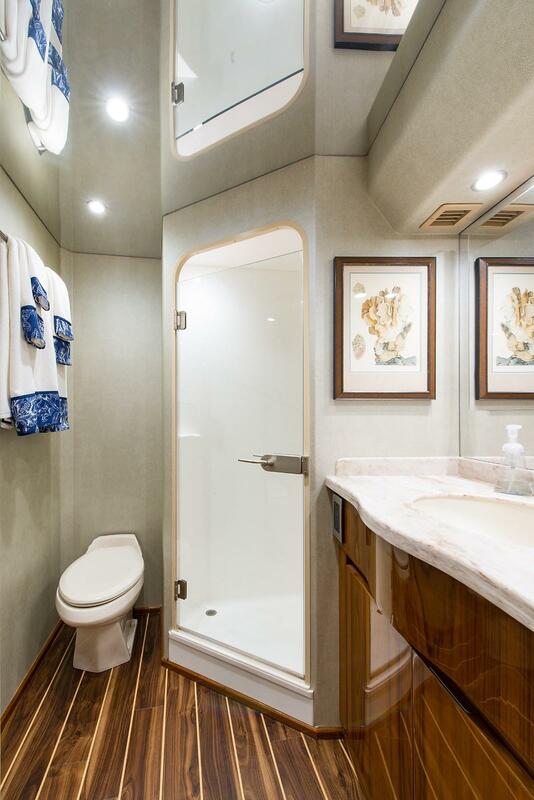 Adjoining is a private head with wood flooring, storage compartment and an enclosed shower. 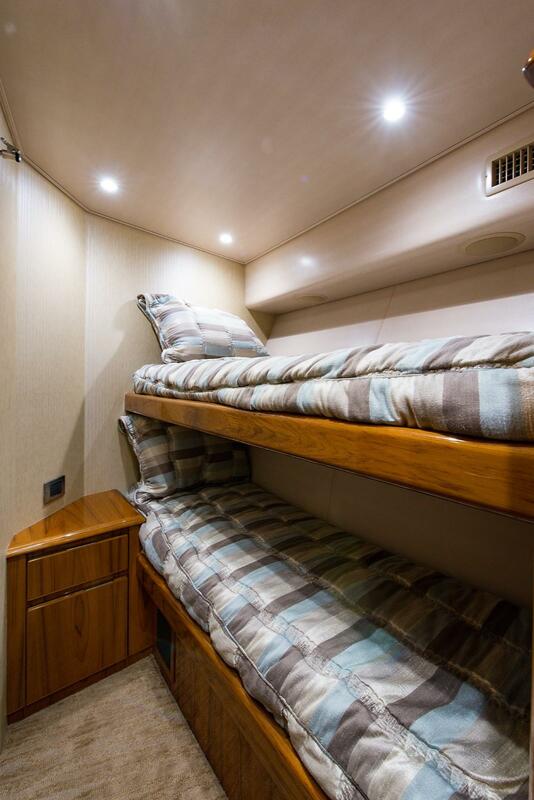 Custom counter tops throughout, custom wall paper, accents, numerous décor upgrades & mattress upgrades are a few of the special features that make this boat a truly unique package. 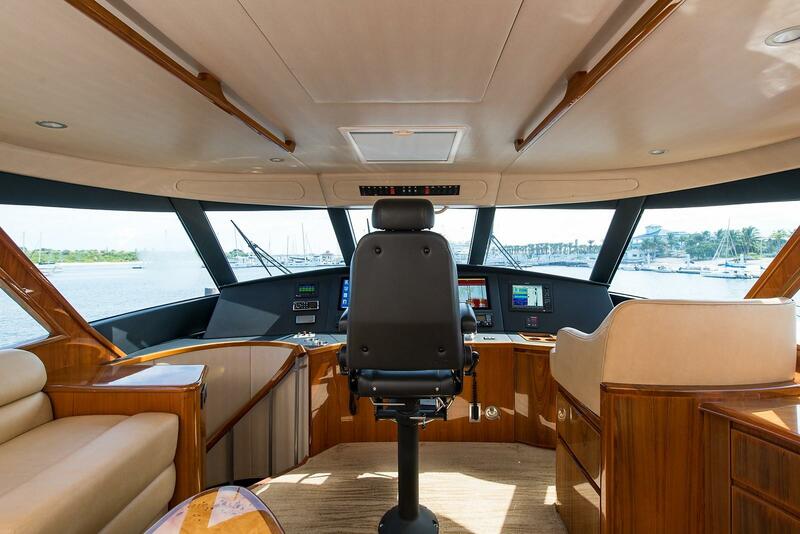 The command center was designed for ease of operation and total cruising/fishing comfort. 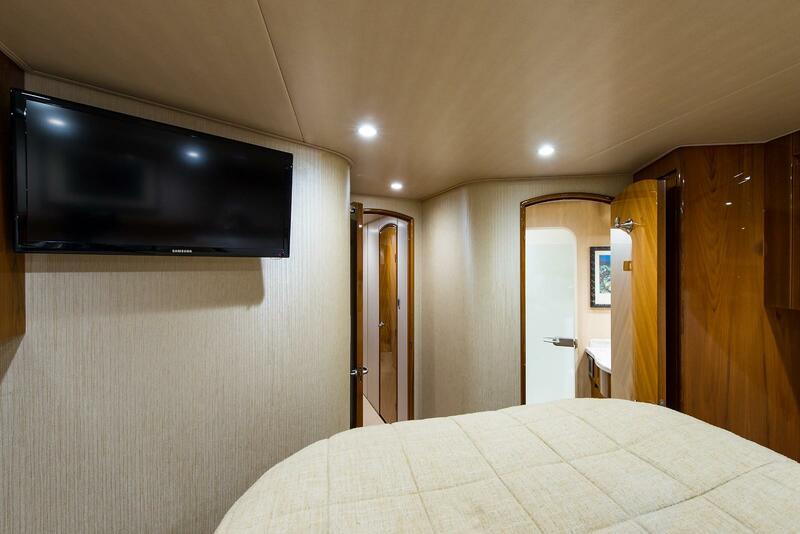 Air conditioning with reverse cycle heat, temperature control and dehumidification mode. 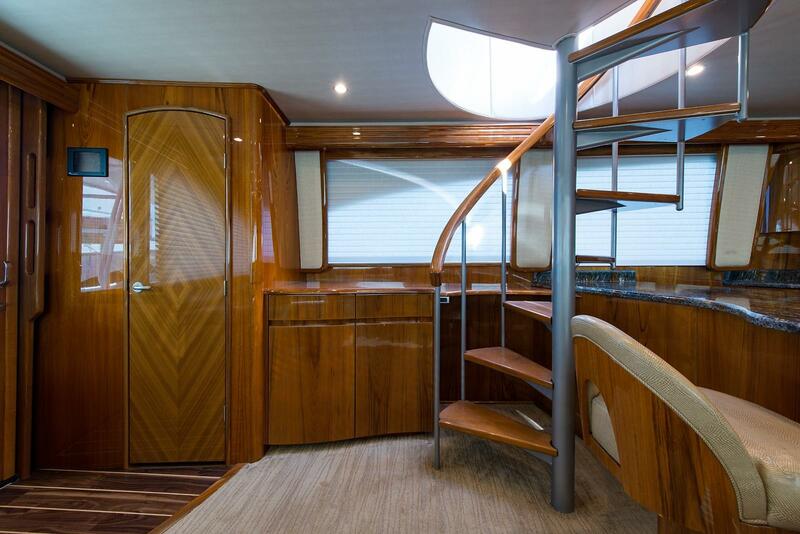 Cabinetry and furniture manufactured of teak hardwood and veneers with furniture finish. 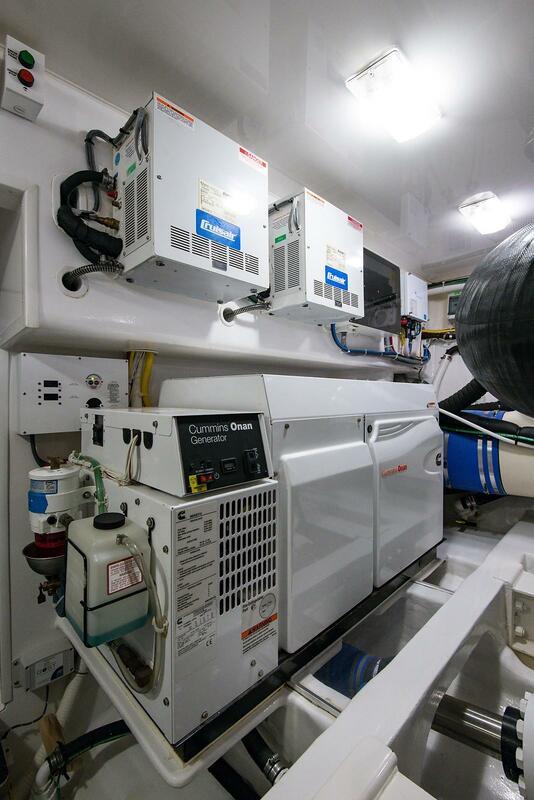 Central vacuum unit connections with hose fittings. 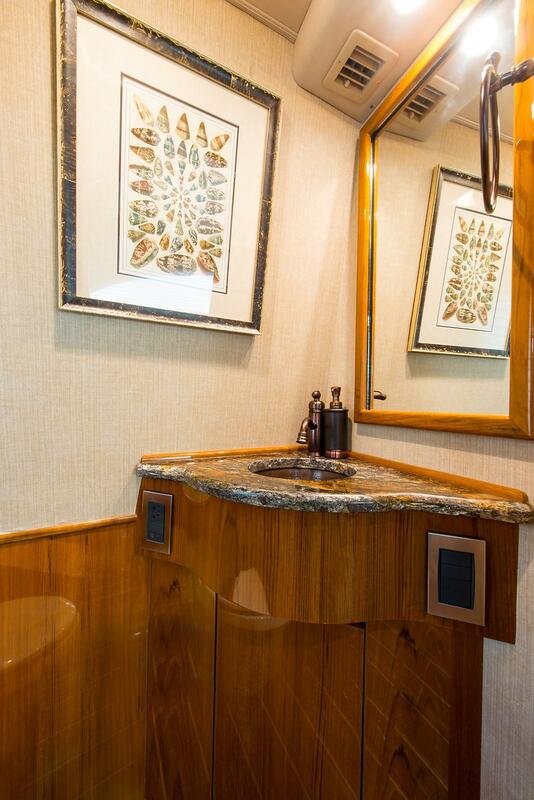 Cocktail table - teak, fixed pedestal mounted. 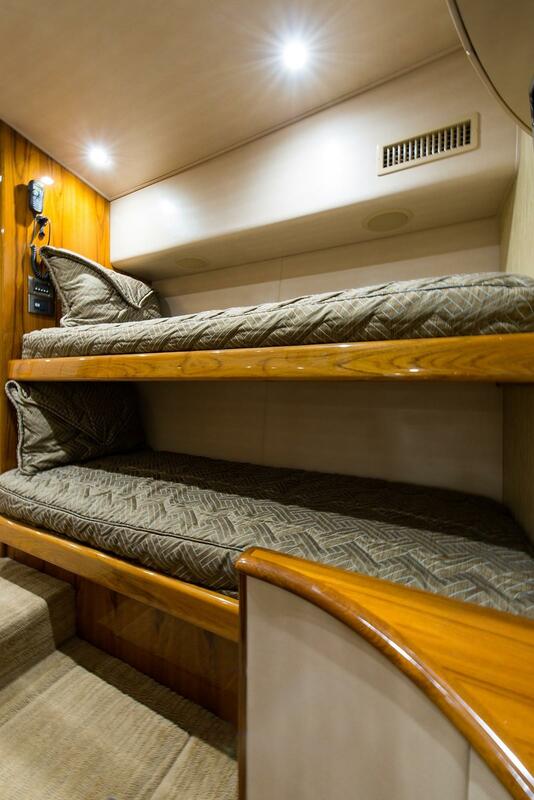 Port and starboard jump seats and drawers underneath starboard seat. 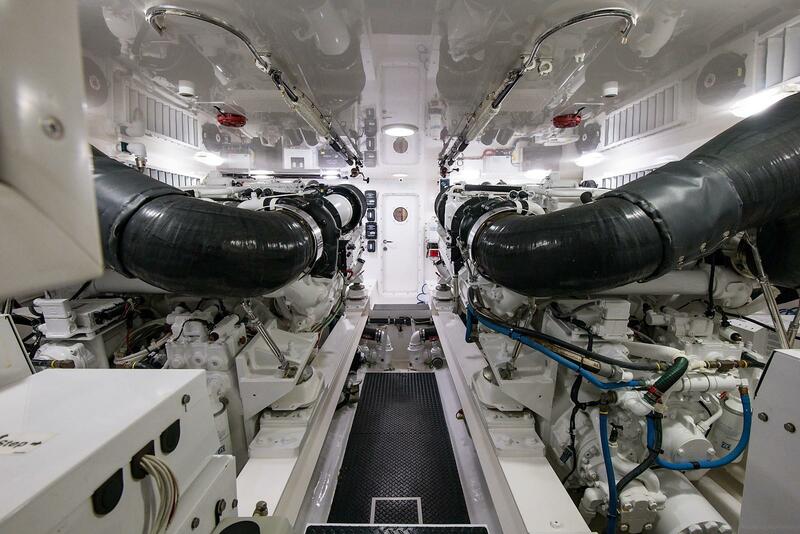 Defoggers for windshield. 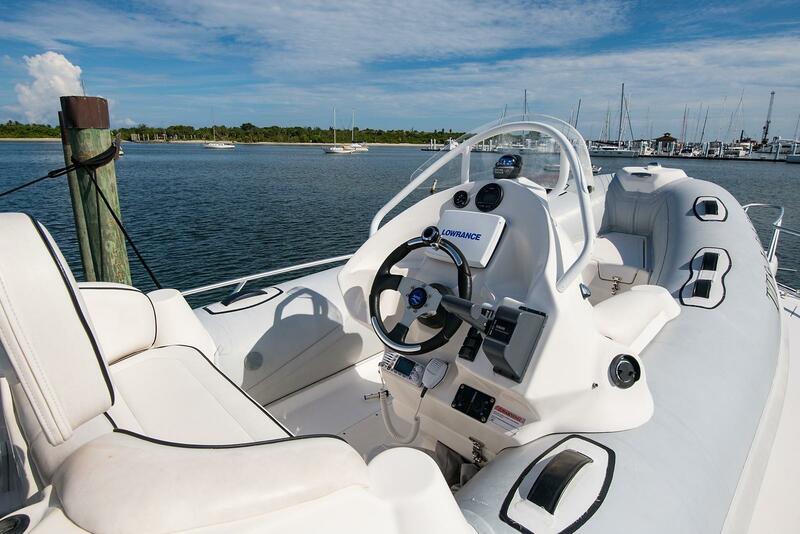 Forward control station with all necessary control switches, lighted instruments, engine controls and VIPER steering. 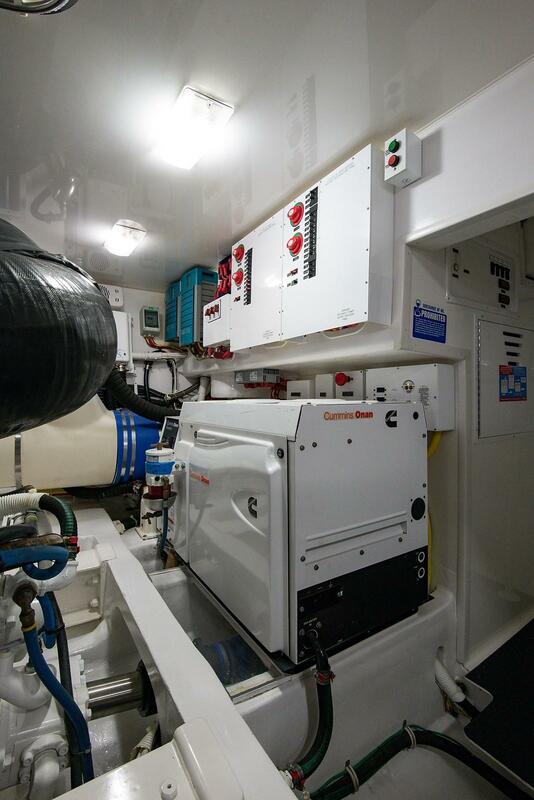 Gauges/electronic displays supplied by engine manufacture. 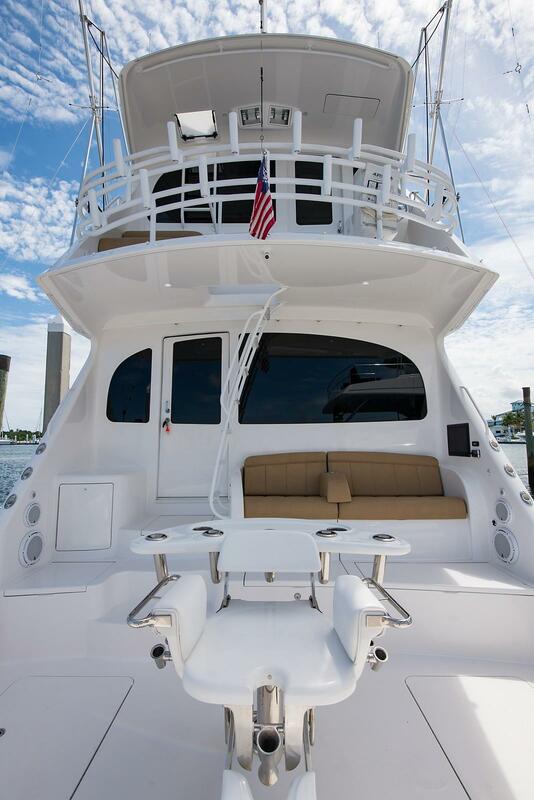 Hatch above helm chair. 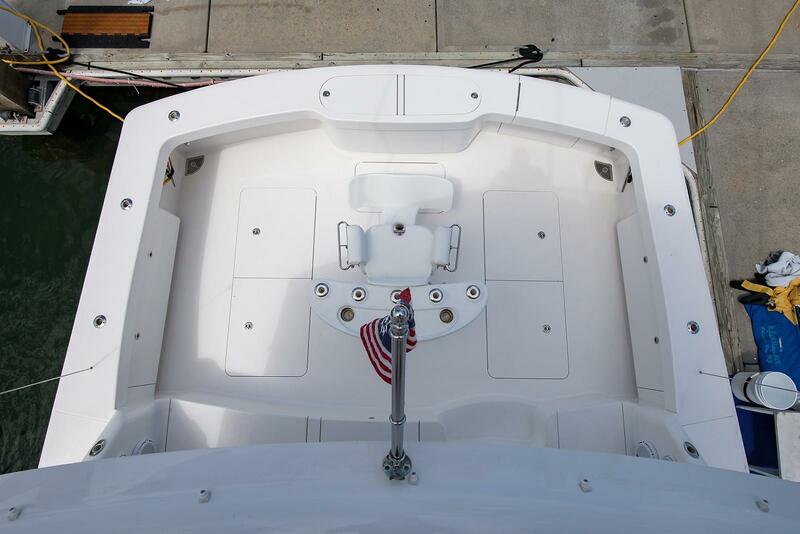 Hatch in overhang with powder-coated ladder and access to hardtop. 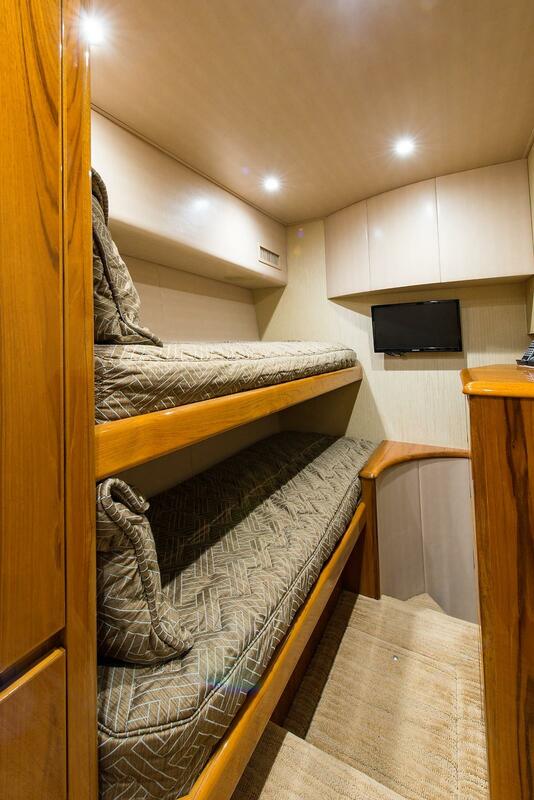 Large under helm area for easy access and added storage. 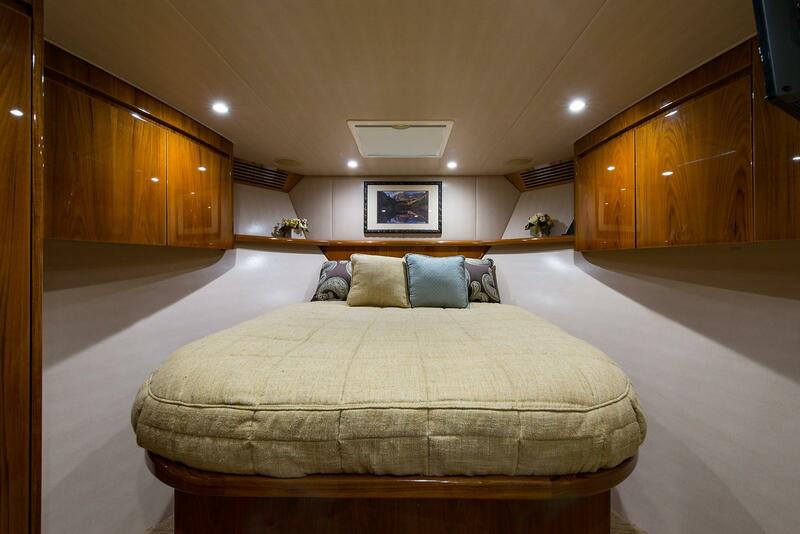 L-Shaped lounge on raised floor for better visibility and with storage underneath. 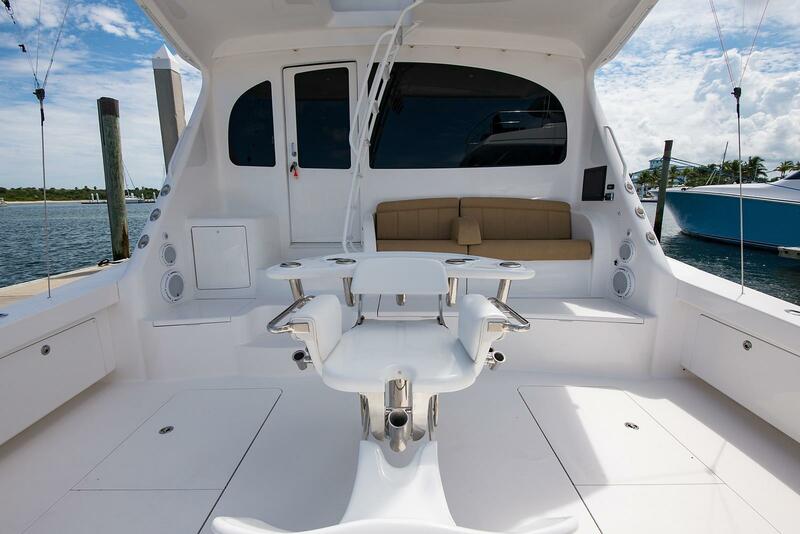 Molded fiberglass seat on aft deck with removable cushions and storage underneath. 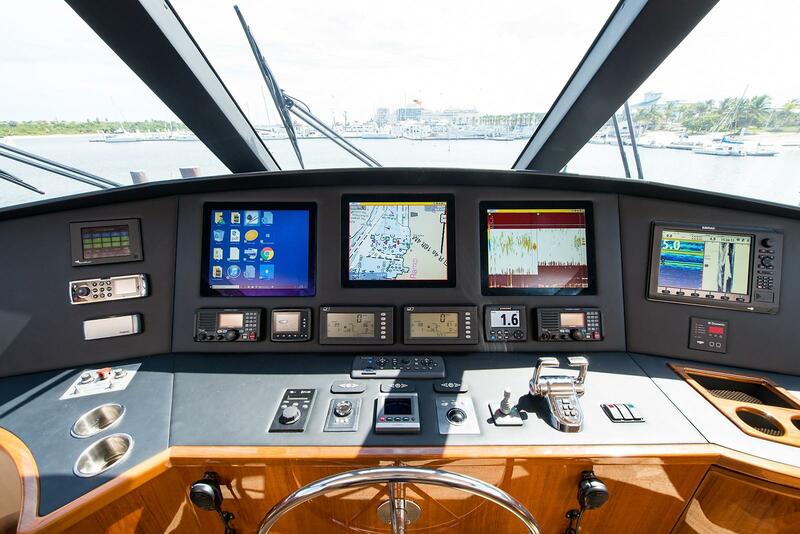 Octoplex touch screen control monitor with audible and visible alarms: fire, engine room temperature, high bilge water, high exhaust temperature, generator and tank monitors as well as confirming correct system operation. 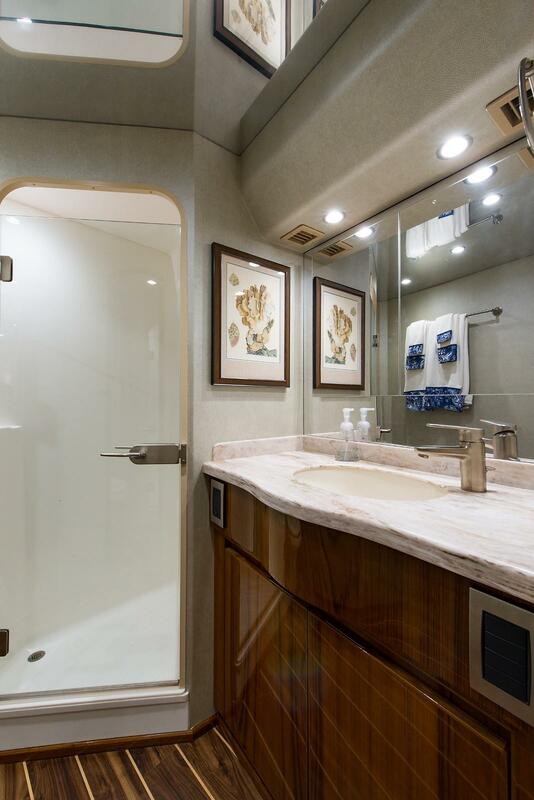 Overhead recessed LED lighting. 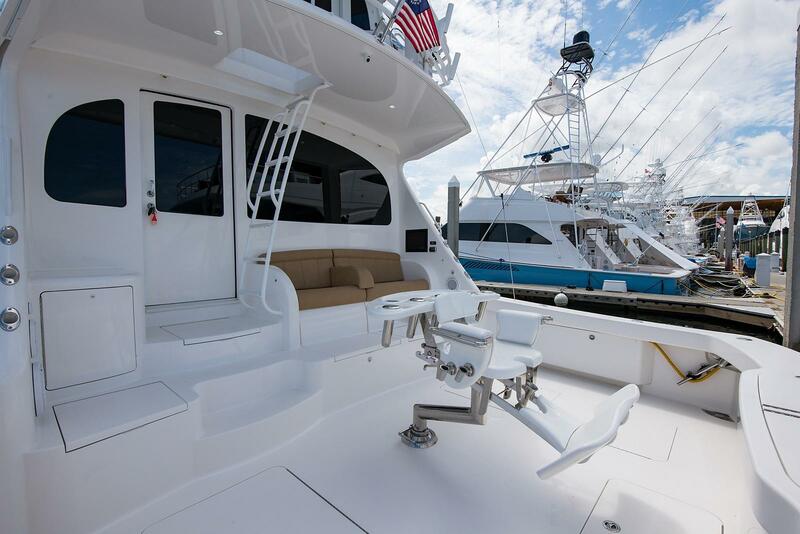 Pro-style aft docking station with surface mounted controls and engine start/stop switches, located at port side of Flybridge overhang Powder coated aluminum aft railing and Flybridge ladder. 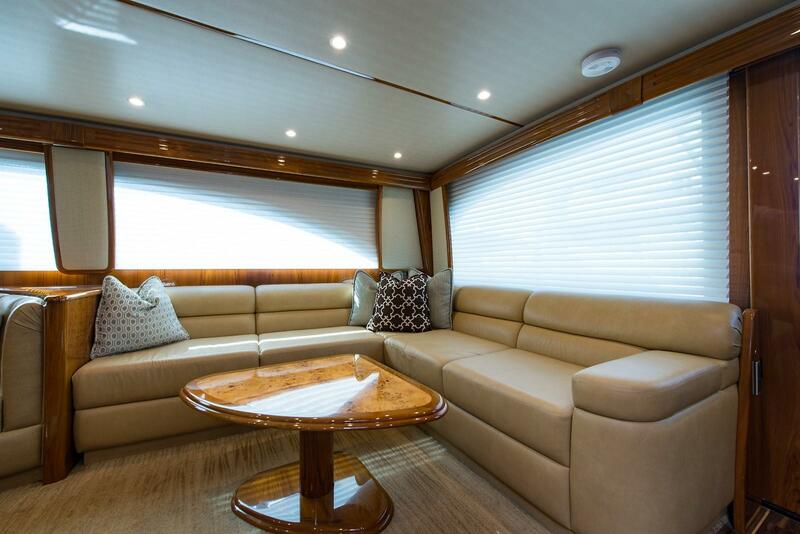 Quartz lights, molded-into aft overhang. 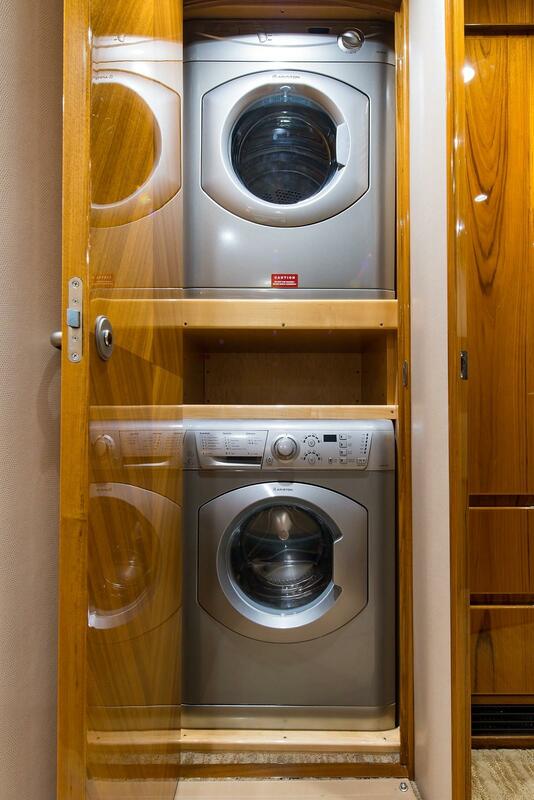 Refrigerator with ice maker. 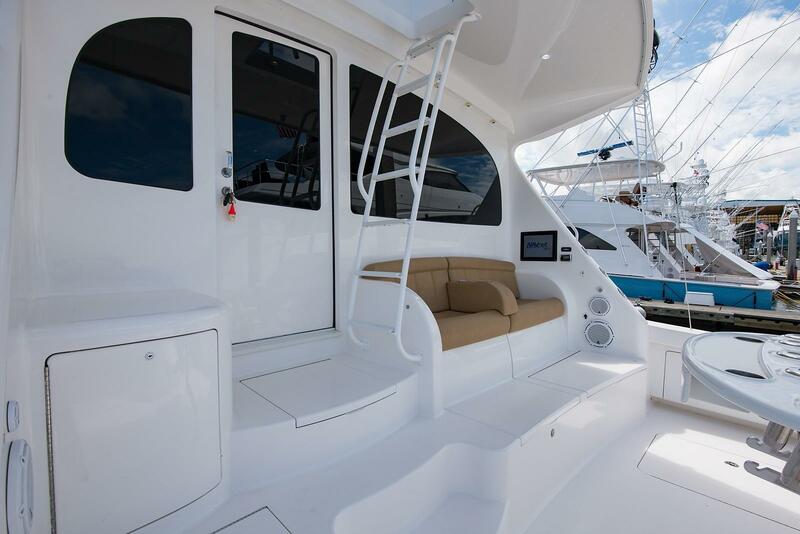 Safety rail at entrance hatch to Flybridge, Stidd helm chair, black, adjustable with footrest TV 19" LED flat screen 12VSC stereo with CD/DVD player Upholstered overhead wiper box with switches mounted centerline Windshield, laminated, curved, safety glass Windshield wipers, electric with intermittent controls, washers Weatherproof hinged, lockable exterior door. 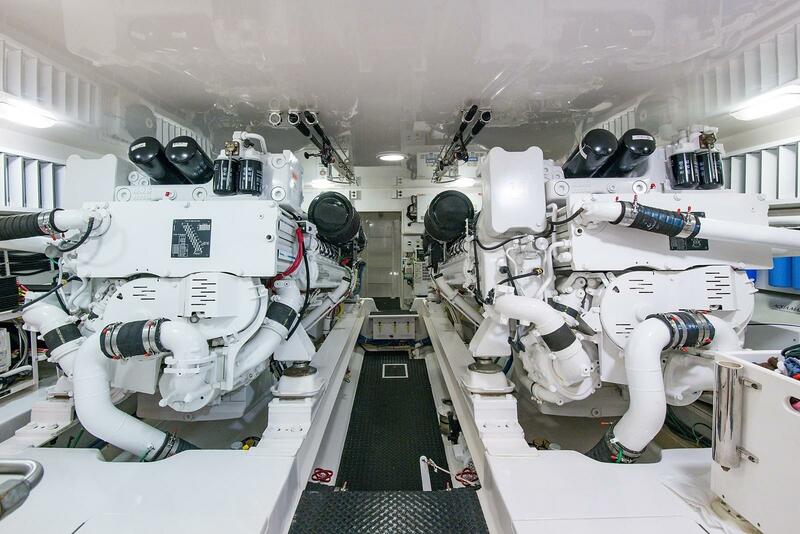 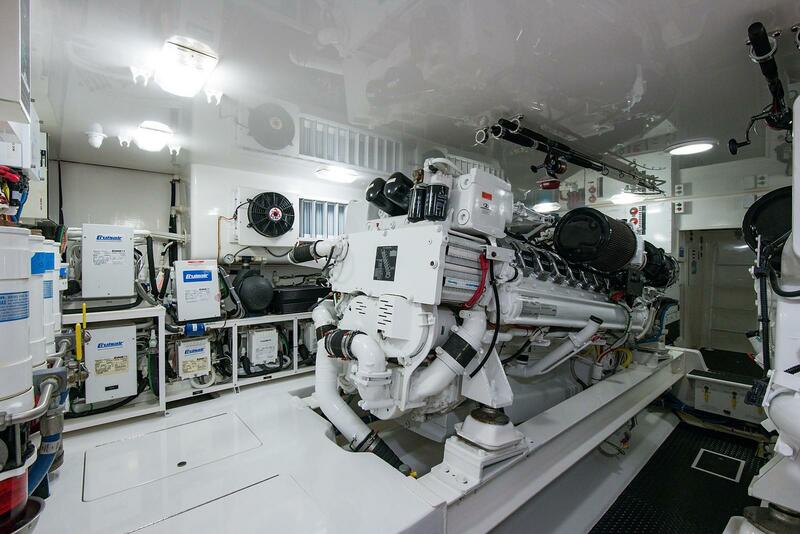 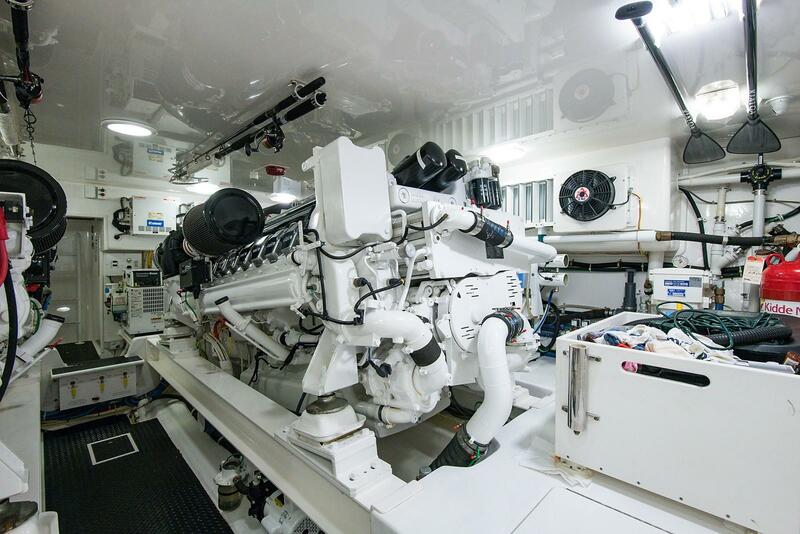 Designed with ease of maintenance in mind, and finished to yacht quality, the engine room and mechanical spaces are easily accessed.